In the 1960s, ‘70s, and ‘80s, scholars divided the earth into three parts: the First World, the Second World, and the Third World. The reigning “three worlds theory,” however, was conceptually incoherent, combining incommensurate geopolitical and socio-economic features. 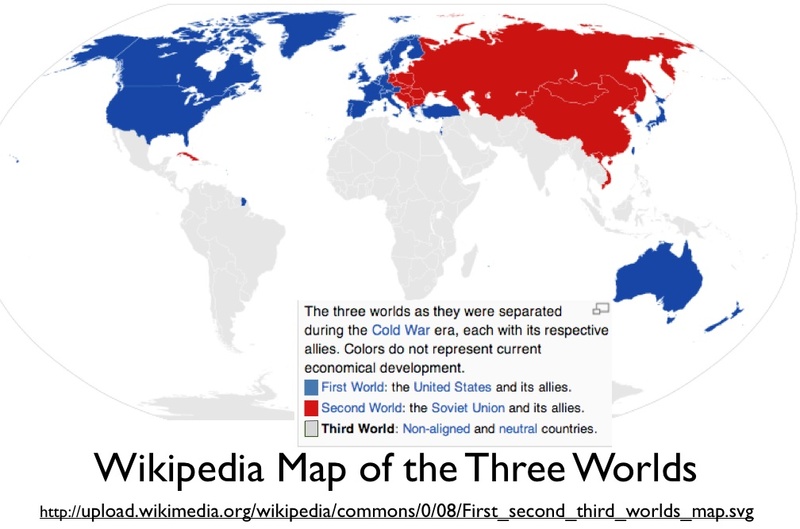 The “First World” encompassed all industrialized, democratic countries, which were assumed to be allied with the United States in its struggle against the Soviet Union. Yet not all were: Finland and Switzerland, among others, maintained strict neutrality. The “Second World” was anchored on the industrialized, communist realm of the Soviet Union and its eastern European satellites, yet it often included poor communist states located elsewhere. The “Third World,” was defined simultaneously as the non-aligned world and as the global realm of poverty and under-development. Poor Soviet allies – Mongolia, Cuba, North Korea, and North Vietnam (after 1975, Vietnam)– were thus counted as Third World in economic terms and as Second World in political terms. China’s Cold War situation was even more ambiguous; a non-industrialized country at the time, it ceased to be a Soviet ally in 1961, and by the 1980s was no longer an enemy of the United States. 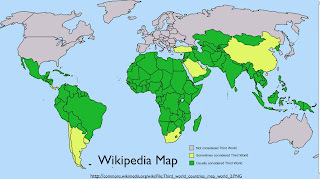 Yet it continued to be commonly mapped as part of the Second World. The very concept of non-alignment, moreover, was always murky. Third World countries, non-aligned by definition, actually made many alliances with the United States and the Soviet Union, although such linkages were often unstable and shifting. When Somalia was a client of the Soviet Union, Ethiopia was allied with the U.S.; when a communist insurrection gained power in Ethiopia in 1974, both countries switched sides. The Three-World model is thus difficult to map, as its categories were inherently ambiguous. 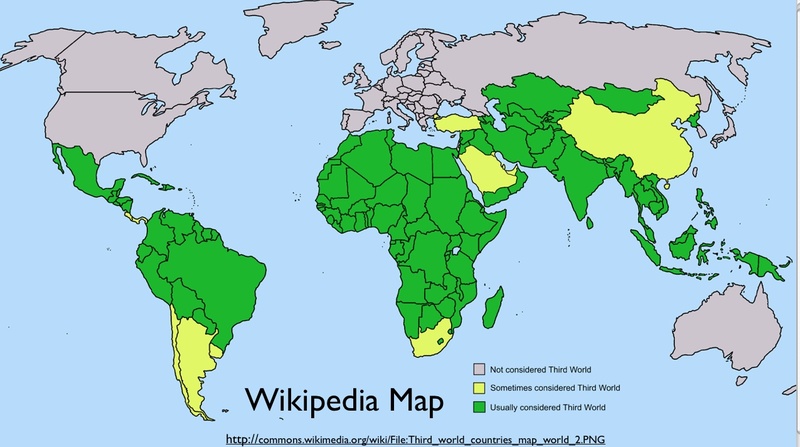 The Wikipedia map posted above attempts to solve the puzzle by considering only geopolitical criteria. Even so, it does not do justice to its subject matter. To begin with, it is anachronistic, depicting both China (pre 1961) and a united Vietnam (post 1975) as Soviet allies. Its depiction of Yugoslavia and Albania as Soviet allies is incorrect, as is its portrayal of Switzerland, Sweden, and Finland as American allies. It also errs in labeling as “neutral” such “Third World” supporters of the United States as Thailand and the Philippines. 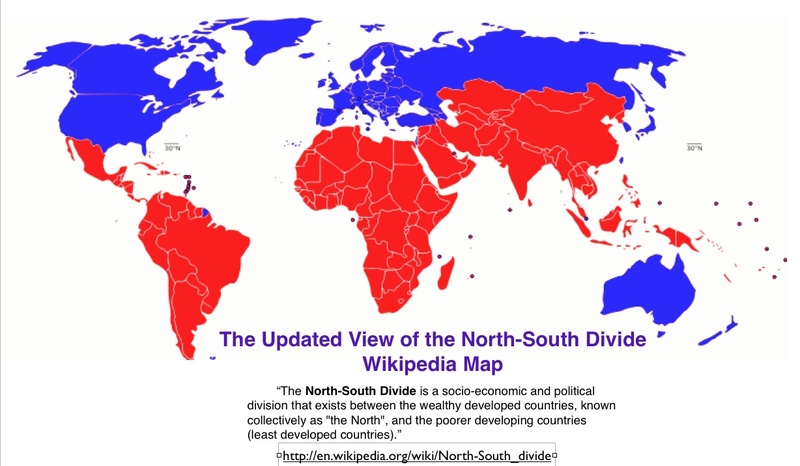 A more considered response to the demise of the Second World was to adopt new terms for the socio-economically divided planet, differentiating a wealthy “Global North” from an impoverished “Global South.” The resulting north-south split, however, was never as geographically fixed as its terms imply; Australia and New Zealand were always regarded as southern outliers of the North. But the model still rests on a fundamental latitudinal division. As the third Wikipedia map posted above clearly shows, high latitude countries are classified as wealthy and developed, while almost all countries south of 30 degrees north are categorized as “poorer and developing.” At least the map allows an honorary northern position for equatorial Singapore, which is not the case for Wikipedia as a whole. An October 26, 2010 Economic Times article outlines the on-line encyclopedia’s push into the “Global South,” which is defined by Wikipedia’s leaders as encompassing all of Asia bar Japan. The North-South global divide appeals because is straightforward and simple, helping to make sense out of a messy world – or so one might hope. In actuality, it is highly misleading. A literal reading of the Wikipedia map, for examples, tells us that the Kuwait, Brunei, and Qatar – with respective per capita GDP* levels of $38,000, $48,000, and $78,000 – are poor developing countries, and that Armenia, Moldova, Kosovo – with respective per capita GDP levels at $5,000, $2,800, and $2,300, and – are wealthy developed countries. Like is classified with unlike, and nonsense results. The world is indeed marked by stark divisions between prosperous and impoverished areas. Such divisions, however, are far too complex to be captured in any simply bifurcation of the globe. Over the few postings, Geocurrents will explore global socio-economic disparities in more detail, trying to make better sense of the geography of wealth and poverty. * Given in purchasing power parity, as measured by the IMF in 2009.